The inaugural Niagara Integrated Film Festival (NIFF) is only a few weeks away! The hugely anticipated event from Toronto International Film Festival co-founder, Bill Marshall, runs June 19 through 22, 2014. Highlighting the world-class epicurean wonders of Niagara, NIFF will take full advantage of its unique location with two special programs. Film Feast is a gourmet wine tour meets short film festival mash-up where fine wines and hors d’oeuvres are enjoyed with a short film from Canada’s Not Short on Talent program. Filmalicious is a sublime dinner and a movie experience, where guests will enjoy a luscious three-course-meal, accompanied by a top selection of wines, and finished off with a stellar feature film, at one of the Region’s top wineries. At the same time, NIFF aims to shine a cinematic spotlight not only on Niagara’s extraordinary beauty, but also on the remarkable talent that comes from this part of Canada. In Niagara Rises, a special program showcasing home-grown Niagara filmmakers, St. Catharines' own Mike Enns kicks it off with the world premiere of Restrung, NIFF's opening night film. Filmalicious is a spectacular “dinner and a movie” event hosted at some of the Niagara Wine Region’s most fabulous vineyards. 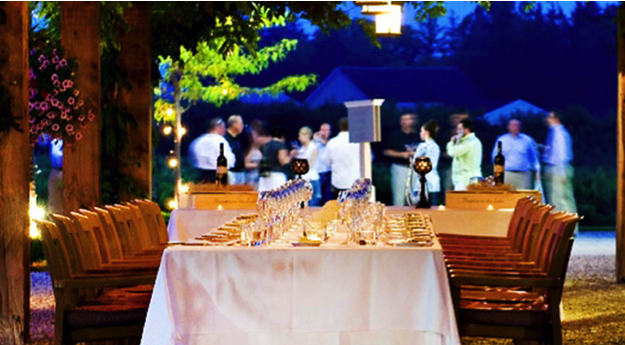 Each vineyard presents a sumptuous dinner with wine pairings from some of Canada’s most talented chefs. Afterwards the movie screen comes out for the feature presentation – a film or films from some of our programs such as: Niagara Rises and Unearthed Treasures. In each case we have done our best to provide you with a guest speaker or other entertainment related to the film’s subject. Many evenings offer the opportunity to partake of the whole Filmalicious experience with dinner and screening ($125-$175 per person), or to arrive later for just the screening and presentation ($25). Mary Pickford Screenings of “Their First Misunderstanding” and other short films and newsreels. The Movie-able Feast! Visit eight of Niagara’s most spectacular wineries, and sample a flight of vintages at each, accompanied by exquisitely prepared hors d’oeuvres and our selection of intriguing short films selected from ‘Canada’s Not Short on Talent’, an annual presentation of the country’s best at the Cannes Festival. We are currently finalizing exactly which movies will be showing at each winery. Please check back soon. Restrung - Official Trailer from ENNS VISUALS on Vimeo.